This article was first published in London Historians Members’ Newsletter of April 2015. The cavalier way in which TfL seems to have treated the Paolozzi mosaics in Tottenham Court Road station until someone noticed and called them to account is indicative of the low esteem that art form is held by many in this country. The spectacular mosaic floors in the National Gallery’s main entrance that combine traditional skill with modern themes are rarely glanced at by the many thousands of visitors who walk on them. On two of the mosaics, Cricket in The Pleasures of Life sequence in the East Vestibule and Exploring in The Labours of Life opposite it, the National Gallery has placed a large urn each, thus making it impossible to see them and drawing attention away from the work. Passing unnoticed. Anrep underfoot at the National Gallery, London. In 2004 the National Gallery did publish a booklet by Lois Oliver, entitled Boris Anrep – The National Gallery Mosaics but that is now hard to find. Yet the spectacular work that should be seen by every visitor who happens to go in the main entrance is little known and its creator, the Russian artist Boris Anrep (1883 – 1969) even less so, though he is responsible for a number of other mosaics in London. There is the Blake room in the Tate Gallery, the entrance to the Bank of England, the Blessed Sacrament Chapel in Westminster Cathedral and a number of works in the Greek Orthodox Saint Sophia Cathedral in Moscow Road, Bayswater. There is also a mosaic in the Notre Dame de France church in Leicester Place but that, curiously enough, was covered up by a screen decorated by Jean Cocteau four years after its creation. A phoenix in the Blessed Sacrament Chapel, Westminster Cathedral. Boris Anrep, who came from a Swedish-Lithuanian-Russian family, was born in 1883 in St Petersburg. His father was an eminent professor of forensic medicine and, later, a deputy in the Third Duma. His two sons were called after the first Russian saints, Boris and Gleb with the latter becoming a well known physiologist, a professor at Cambridge and in Cairo. Boris attended a school in Kharkov (now Kharkiv in Ukraine) and spent a year in Great Missenden in 1899 to learn English. He was intended for the law and became a student at the prestigious School of Jurisprudence at St Petersburg but around 1908 decided that the life of the poet and artist was preferable. By this stage he had become acquainted with a number of artists in Russia and decided to study in the West in Paris, at the Académie Julian, where he made friends with Henry Lamb and Augustus John, who introduced him to the rest of Bloomsbury Group. This connection became very important in Anrep’s social and artistic life. In 1910 – 11 Anrep and his wife Yuniya lived in Edinburgh where he continued to study art and began to complicate his life maritally and sexually. In 1911 Helen Maitland, a close friend of Dorelia John and an ex-girlfriend of Henry Lamb became his mistress and the three of them lived mostly in Paris. Helen was to be the mother Anrep’s children, Anastasia and Igor, but did not marry Boris till 1918 when he finally divorced Yuniya. By this time he had acquired another mistress, Maroussia Volkova, his sister-in-law’s sister, and the domestic triangle repeated itself, this time in England. Astonishingly, it was not in Bloomsbury but in Hampstead that the Anrep menage settled but in 1926 Helen left Boris for Roger Fry and the former, after displaying rather strong signs of jealousy, departed for Paris with Maroussia and acquired another mistress, the artist Jeanne Beynal. Anrep was responsible for the Russian section in the 1912 Second Post-Impressionist Exhibition but had, by then, decided that his interest lay in mosaics, particularly in bringing together the more traditional ideas and forms with more modern contents. In 1914 he created mosaics for the Crypt in Westminster Cathedral but his work was interrupted by the First World War during which he served with the Russian Imperial Guard in Galicia and had an affair with the great Russian poet Anna Akhmatova. He returned to England in 1917 to be Military Secretary to the Russian Government Committee, went back once more in the autumn and left Russia for good as the Bolsheviks came to power. In the next few years he created mosaics for private homes, mostly those of his friends and a few other clients. He started his habit of including portraits of people he knew into those mosaics, merging traditional patterns with ideas of the jazz age. In 1923 he was commissioned (his friend Maynard Keynes was helpful in getting him work) to create the floor of the Blake Room in the Tate Gallery and he used it to illustrate The Proverbs of Hell from The Marriage of Heaven of Hell. Although he now lived and worked in Paris, his major works were for England (and Scotland though, as a Russian, he might not have considered the difference important). In 1927 he began the mosaics for the Bank of England, a huge labour that was interrupted by the Second World War and was not completed fully till 1946. In 1928 he created mosaics for the Greek Orthodox Church in Bayswater and the first of the floors for the National Gallery, The Labours of Life in the West Vestibule. Though the idea is a traditional one, the images are idiosyncratic and of the period. It is a pity Exploring, in which a zebra is being filmed, is now obscured by that urn. Science is once again relevant as it depicts a student looking at the diplodocus carnegii at the Natural History Museum. The following year Anrep decorated the East Vestibule with The Pleasures of Life, an imaginative and non-judgemental view of various jolly events. Critics noted the presence of girls in short skirts and with bobbed hair. The third floor, on the Half-Way Landing (all three were paid for almost entirely by Samuel Courtauld) was finished in 1933 and consists of a The Awakening of the Muses, with Apollo, Bacchus and eight of the Nine Muses represented by recognisable people, mostly from among Anrep’s friends in the Bloomsbury Group. He also added Greta Garbo as Melpomene (Muse of Tragedy) and an imaginary woman as Calliope (Muse of Heroic Poetry). Boris and Maroussia escaped from Paris in 1940 and for the rest of the war they lived in Hampstead (with Boris, inevitably, starting another liaison with Maud Russell who was to pay for the last floor in the National Gallery) and he, apart from working on his mosaics, also transcribed Russian broadcasts. After the war he went back to Paris where he lived till 1965 with Maroussia dying in 1956. His last years were spent in Hyde Park Gardens with Maud Russell. Modern Virtues, featuring Churchill. National Gallery, London. Anrep continued to work until almost his death and, unlike many other mosaicists, he created his own work, choosing the materials, making the designs, laying down the mosaics. In 1952 he finished the last of the National Gallery floors in the North Vestibule, The Modern Virtues, which includes people he knew in England and in Russia as well as public figures. Here we can find Margot Fonteyn, Loretta Young, Anna Akhmatova, Winston Churchill, Bertrand Russell, T. S. Eliot and others representing slightly unexpected virtues as well as a picture of a Christmas Pudding and of the artist’s last resting place. There were private commissions but the last great work, completed when Anrep was nearly eighty, was the very fine Chapel of the Blessed Sacrament in Westminster Cathedral which went back in style to the pre-Byzantine Roman mosaics, with little gold and far from the expected monumental sightless figures. They are full of colour, light and rhythm – another union between traditional and modern in subject and pattern. Snapshot of Boris Anrep, 1920, by Bloomsbury hostess Lady Ottoline Morrell. © National Portrait Gallery, London. Boris Anrep died in 1969. He had been a huge, in every sense of the word, figure on the English artistic scene, a man loved and admired by various friends and pupils. A keen tennis player who competed in the men’s doubles at Wimbledon in 1920, an excellent cook, a generous host and guest, one who could stand up to Augustus John in fisticuffs and who, quite astonishingly, excited the love of Lytton Strachey (One wonders what Boris made of that). He also left a mark in the history of public art of this country, which makes it rather sad that so little attention is paid to him. The only biography is by Annabel Farjeon (another writing Farjeon) who had married his son Igor. The manuscript is in the possession of the Anrep descendants but has never been published in English. It was translated into Russian and published in St Petersburg in 2003. Perhaps, it is time for a British publisher to have a look at it. 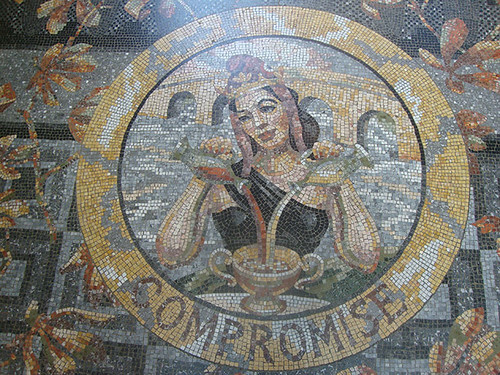 A selection of Boris Anrep mosaics in our Flickr gallery.